It used to be that compact cameras were bought for their ease of use – point, shoot, job done. Now compacts are vying with DSLRs when it comes to features, with the Samsung WB2000 being of no exception. Samsung is billing the camera as 'dual action'. What this means is you can simultaneously take images and film Full HD video. This is something which has been a mainstay on camcorders but a feature that's been hard to come by in the compact camera market. Granted, this is not a feature you would want to use all of the time, but not having to flit between modes will be a boon to those who want to capture the moment and not have to worry about a 5-10 second lag when switching between still and movie. Samsung has given the WB2000 a CMOS sensor, which has been combined with a re-engineered DRIMeIII processor. This means that low-light shooting has been enhanced and the speediness of the camera improved. If you so wish – and you will probably want to if you are trying to capture fast-moving images – the WB2000 will allow you to take up to 10 pictures per second at full 10MP quality. And it's not just in the still image department where Samsung has ramped up the speed. The recording mode will film up to 1,000fps. Slow this footage downs and what you have is something akin to the ultra-slow shots made famous by the filmmakers behind Planet Earth. Like most of Samsung's cameras coming to the market in 2010, the company has opted to add a 3.0-inch AMOLED screen to the WB2000. If you are not familiar with the technology, essentially it makes the screen super-bright, helps with battery life and it means that you will be able to view the screen in bright sunlight and even the most unsightly of angles. Other features include: Advanced Panorama Shot with Object Tracking, RAW Support and Full Manual Control. Full HD shooting on a compact camera is still in its infancy, with Samsung and Sony the only ones to announce this option so far. This is what makes the WB2000 something of a desirable product. It's easy enough for the point-and-shoot crowd to use, but there are plenty of features on board here (not to mention RAW support) that will keep enthusiasts happy. 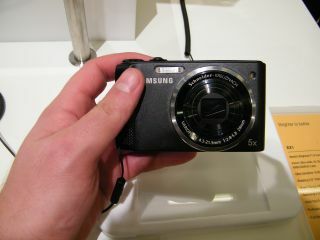 The Samsung WB2000 has a UK release date of Spring 2010 and will be priced at £329.99.